Not only was Richard Perle feeding the American Thinker what he wanted them to report during the Iraq war and Plamegate. Turns out he was also sautéing foie gras for American Thinker editor Thomas Lifson and friends. Lifson's good friend Bob Lee tells of an intimate gathering at the house of Washington insiders Clarice and Howard Feldman, where Perle played a co-host of sorts. Yes, this is the same Clarice Feldman who writes for American Thinker and who recently insisted that Plamegate was not a deliberate plot by Goerge W. "Bush and pals to distract from Iraq." It also turns out that Clarice Feldman considers Richard Perle such a good friend that she puts him to work in her kitchen when he attends her soirées. Here's what Bob Lee wrote about the intimate gathering. There were probably 1000s of other such conversational gourmands meeting inside the Washington Beltway on Friday night. Nine adults enjoying a 4-course gourmet dinner au conversation. Ours had a former Asst Secty of Defense, the ex-wife of The Head of The World Bank, a military historian, a Libby Trial aficionado, a right-wing fanatic from Berkley, and a North Carolina couple referred to as friends of Tom. … That grotesquely hilarious report about Apple Cheek Johnny's Poverty Castle ??? Wait til BobLee tells you THE REAL STORY! If you want to skip down to the hilarious REAL STORY about Apple Cheek’s Monster Manse go ahead … but do come back up for this account of our Foggy Bottom Fandango. Remember The Brunswick Stew Party a few years ago. Given my druthers I’d take that over Friday night for pure conviviality plus b-stew trumps foie gras every time with me. But, our dinner party in a prominent DC-A list neighborhood certainly added a few memories to the life larder. The Mizzus could not get out of Georgetown fast enough Saturday as urban congestion about did her in. With me it was the Euros and faux Euros that slink up /down M Street. They are sorta like Shineolas except they (the Euros) have greasier hair. Our dear friend Thomas The Berkley Right-winger had invited us. Clarice and Howard were our gracious hosts. We had no idea who was on the guest list, nor did they. They likely still don’t know and we’re still not sure ourselves. Howard perked up when I said I am a legendary humorist. So is my brother he said. Feldman ... yikes ... was this MARTY FELDMAN's brother??? ... Hump, what hump ... Walk this way ... I'll take the one in the turban. No ... Michael Feldman ... an NPR talk show guy that is well outside my interest sphere. When the big man in the hat said his name was Richard Perle I first thought the guy that started those Vision Centers. Close … the former Reagan Asst Secty of Defense not affectionately known around DC as the Prince of Darkness. Richard, legend has it, was the first one to get GWB’s ear after 9/11 and strongly recommend taking down Saddam ASAP. I introduced myself as the last remaining member of The Flying Wallendas and Mizzus said she was Stephanie Powers’ younger sister. I detected a glimmer of recognition with the name Wallenda but it flickered and died quickly. After game after game of “hey look, IT’S BOBLEE…” it was sort of nice to be naught but a whozit for an evening. Now I know how those three little white boys at the end of Dean’s bench musta felt all those years. A pre-dinner conversational mini-joust highlighted by one of Thomas’ Napa Valley finest led us to the dinner table. I was seated between Thomas From Berkley and a little Jewish lady named Clare with a daughter at Chapel Hill and an ex-husband who was almost CIA Director and instead is Head of The World Bank – Paul Wolfowitz. Mizzus was between Richard and Peter The Lawyer From Annapolis. During the course of four courses and about two hours of chitting and chatting, Peter actually used the word Parenthetically ... TWICE. In well over 50 years I’ve never used in once nor do I ever intend to. Peter used it with a deftness that would lead one to believe he uses it daily if not hourly. I wonder if Paul Johnson, a football coach who lives in Annapolis, has ever used the word parenthetically? I doubt it. Clarise explained it all … she had asked Richard to sautee the foie gras. Although he knew one should slide the foie gras delicately into the hot pan, silly Prince of Darkness DROPPED the foie gras from several inches above the skillet … voila … grease spots all over his shirt. And this was the man that convinced GWB to take out Saddam! I wonder if Cindy Sheehan knows how to sautee foie gras? The thought occured to me twixt Course Two & Three ... suppose Ol' Fruitcake Freddie From Franklin Street had been hiding under the table? That silly wabbit's tin foil hat woulda been spinning like a top. Lord have mercy, Freddie would have been dialing up the Mutha Ship for sure to report a new CONSPIRACY! I cleaned my plate because that’s how I was raised plus, like Mikey, I eat most anything. Mizzus nibbled and later expressed her pique at the goose liver. The Beef Wellington of Course Three was equally tasty to me but a bit too rare for Mizzus. As the evening progressed everyone seemed to assume familiar roles … listening to Richard Perle tell about meeting with world leaders and getting the Chi Coms to reduce the price of AK47s to the Mujaheedin. 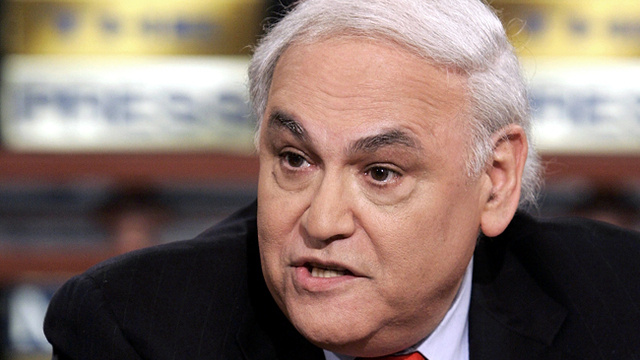 Richard Perle does NOT care much for The Saudis. In other words, the same chit chat you get about anywhere. Richard did ask me which other humorists I admire the most. Since I did not mention PJ O’Rourke or Robert Benchley it didn’t much matter who I mentioned. I deftly dropped Dave Huxtable’s name and I thought I noticed a slight shiver from ex-Mrs Wolfowitz. John McCain’s name came up. Mizzus did that finger down the throat gag sign which took Peter Parenthetical aback. The military historian lady even pretended to care on that. Richard seconded Mizzus’ low opinion of McCrazy with a few stories on him that likely are not in his official bio. Apparently John McCrazy has a hair trigger temper and the attention span of a gnat. But, unlike Barack, he has normal ears ... and unlike Hilly, he has discernible ankles. I noted to ex-Mrs Wolfowitz that out-of-state tuition had just been increased at UNC. She said she didn’t care since her(daughter’s) father can afford it. He’s head of The World Bank. She’s likely right. I tried a second question tied to 40 Point Frank’s next career move. I lost ex-Mrs Wolfowitz … never to regain her. I later learned she is a somewhat famous anthropologist specializing in Sumatra. She woulda lost me quickly on that. We did learn all about the shadow government that really runs Washington … the insidious webees that have been in place forever and defy all administrations and/or new personalities. Clarice, our gracious host, attends the Scooter Libby Trial each day. She had many harsh words for Prosecutor Patrick Fitzgerald. I later learned from Thomas that there are at least two websites devoted to people who dislike Clarice a lot. TWO … My kinda woman! On the drive home Saturday we stopped at the Silver Diner at Potomac Mills. Mizzus had a grilled cheese. I had a crab cake melt. It was good. Wow. Although no doubt unintentionally, Bob Lee has opened a serious can of worms for the American Thinker by preserving for the record the events of that little get-together. If Richard Perle was feeling chatty enough to talk about "meeting with world leaders and getting the Chi Coms to reduce the price of AK47s to the Mujaheedin", why did Lifson and Feldman not find this interesting enough to write about? And as long as Perle was telling war stories, why didn't Lifson or Feldman ask him about more current topics, such as the 550 Tons of yellowcake that was then still sitting in Iraq? And while we're at it, why didn't the American Thinker editor ask Clare Wolfowitz about the letter she wrote to George W. Bush that derailed ex-husband Paul Wolfowitz's bid to be the director of the CIA. 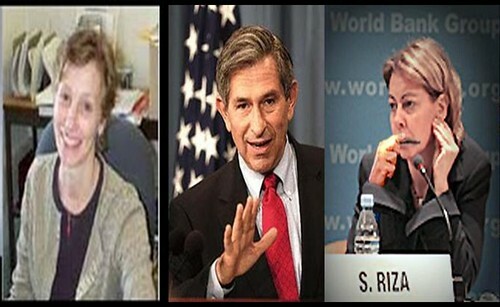 Instead, Thomas Lifson and Clarice Feldman continued to publish stories attacking those who disagreed with Perle or Wolfowitz without disclosing that they were close personal friends. How is that for journalistic integrity? We now know that Clarice Feldman's ridiculous attack on Sibel Edmonds' credibility, claiming Edmonds "misunderstood what she had overheard," certainly must have come from Richard Perle. We also know that Feldman cannot name Perle as her source for that dubious claim due to the fact that Edmonds made it clear that if the FBI wiretap tapes she translated were ever made public, Perle would go to prison. Remember, the Department of Defense, Perle's old stomping grounds, was instrumental in invoking states secrets privilege on Edmonds so that she could not talk publicly about what was on those tapes. Bit of a conflict there, don't ya think, Clarice? If that's not enough to make you ask who's running things at the American Thinker, we have reason to believe that the "military historian lady" at this private gathering was none other than Laurie Mylroie. If so, we have a few questions for Clarice Feldman's "dear friend" Mylroie as well. Perhaps Lifson or Feldman will get back to us on that. In any case, we can hardly wait to read Judith Miller's tell all book due out this spring. Judith, can you give us a preview? The real reason the Blagojevich tapes won’t be unsealed » « Did Clarice Feldman just say “Plamegate was a deliberate plot by Bush and pals to distract from Iraq”?